Booked Innsbruck flights and an apartment for a week in Vigo di Fassa. From 13th January 2019. Will book a hire car to get there. Only done a few days in the Dolomites previously (Cortina & Madonna di Campiglio) so really looking forward to it. If the weather is good, my advice would be to ski like a mad bhasterd all week! First lift is quite early so no excuses! The runs down into Pozza di Fassa are excellent and quite, should be particularly so in January. There's a restaurant on the Buffaure red called Soldanella that is excellent. 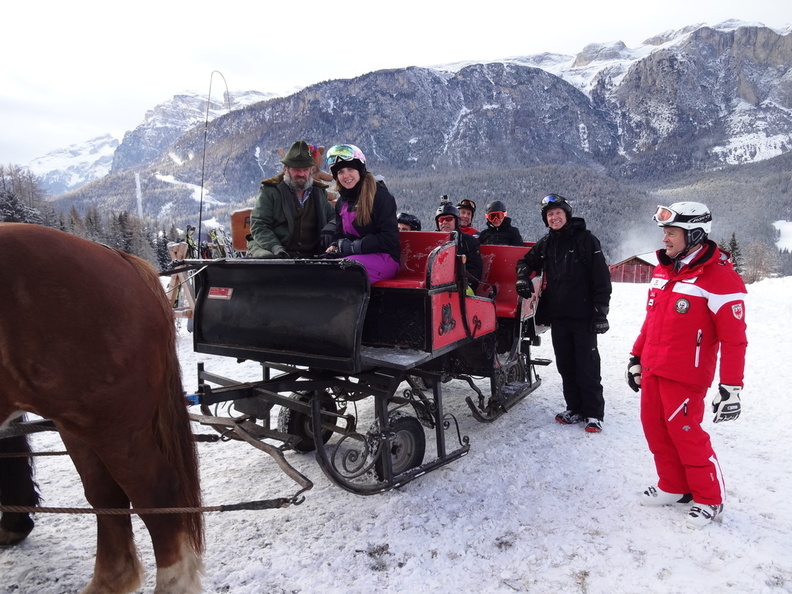 Some might find it a challenge but it is more than possible to get round the sella ronda from there even with a decent lunch stop. Great spot to be with a car to access a huge amount of skiing up & down the valley and around the Sella Ronda linked areas. Weather & snow conditions will dictate where you'll go & how much you'll see, but you will enjoy it. You have a choice of 3 liftpass options in order of ascending price and area covered: Val di Fassa/Carezza, Valle Silver & Dolomiti Superski. The local area Catinaccio is small, but with the spectacular backdrop of the mythical Catinaccio/Rosengarten range. You can ski it out in half a day, but the Thoni red back to Vigo is a lovely sweeping run down through the forest. From Innsbruck you will cross the Brenner (1370m) and the Costalunga (1745m) passes, but Austrian hire cars have winter tyres and both are important routes that are kept clear or cleared quickly, so you should be OK except in the worst weather. There is a lower altitude route that avoids the Costalunga in snowy weather, you stay on the A22 to Ora, then SS48 over to Cavalese and up the valley to Vigo. If you like exploring and travelling long distances on skis I would suggest getting the Dolomiti Superski pass, as that opens up everything in the area. These will all require a short drive to the appropriate lift base (in brackets). Wow! Some great info there - thanks for all of that . We love covering the miles, so can't wait. Sounds like the car will be handy and it's Dolomiti Superski R us! Yes, Vigo is a village on the hillside that has expanded with the growth of tourism, has a few hotels, shops, 2 small Coop supermarkets and a few restaurants. Neighbouring Pozza is a bit bigger and has a bit of a town centre with a full range of amenities. I've had good service from Gross Sport ski shop there. There is a large Coop at the southern end of Moena, if you want to do a bigger shop. Maybe stocking up at a Lidl on the way from Innsbruck might save a bit of cash, there are stores at Vipiteno (Sterzing), Bressanone (Brixen) & Bolzano South, not too far from Motorway exits. The busiest spot for apres used to be the Rosengarten pub in the old part of Canazei near the home run. Canazei is also fairly lively in the evenings. It used to be the drinking games with the Danes & Russians in the Lieber Augustin or jiggling with the cool Italian Dolce & Gabbana set in the Husky Piano Bar, but that all may have changed now. I stayed at Pera at the far end of Pozza in 2017. But this was my trip report when I visited Canazei in 2009, most of the info still applies, though the prices will have increased. Where is this 'Gannet's Eye' he's talking about? Not as funny as what one fellow skier called it...it sounded like 'Gay Nazi'...now that's a contradiction in terms!! "Where is this 'Gannet's Eye' he's talking about? " Bob's mate: Where are you going skiing this year, Bob? Bob's mate: Oh, go on tell me...where are you going? ^^^^Doesn't work at all for us Norverners! ...a bit like my Cockney mate's joke: Q: Did you hear what happened to the Avon Lady? We are heading out to Canazei on the 19th, just started the snow watch now. We also did a week in Selva a couple of years ago and found a great guiding service, it may have been free or cost about 10Euro a day but then that may have been a tip I can't really remember. The guide was a retired local instructor who took out groups of about 6 to 8 people, minimum standard for the tour was confident and reasonably fast on a black so there were no stragglers holding the group back. We spent three days with him and ended up at the apri bar with him on these days too. It was a great cheap way to get to know the entire sella ronda quick, so worth checking out if the offer that service wherever you end up. He also took us to great lunch spots too. Where did you find this guiding service? It sounds fantastic. I think there was a card in the hotel and a marked meeting point near the lifts. Of course the reps know nothing about it. The guide was very good and gave ski tips throughout the day too, what did he get out of it, his tips as well as a free steak every lunchtime at each of the restaurants we stopped at. Of course Luigi and cameronphillips2000 and allbob and others could all out do my knowledge. Only 2 weeks to go until our trip. Can't wait as just love to try new places and our Dolomites experience to date is only a few days in Cortina and Madonna di Campiglio.